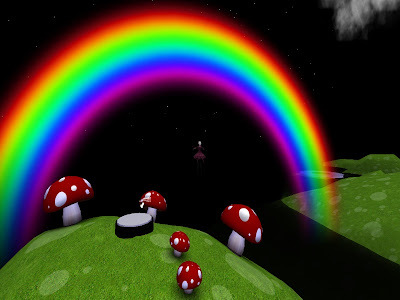 Just stumbled upon this excellent demo by Vlad Bjornson of Second Life's Havok4 physics engine, which is still in beta. On his YouTube posting, Vlad indicated that "Even for a beta test the system seems pretty stable. At one point I had roughly 1,500 physics-enabled boxes in a huge pile. The sim sort of hiccuped for a moment, but then went about it's business like nothing was happening. :)"
artoo Magneto... you are becoming a habit. Heh, maybe not entirely NPIRL, but this is too hard to resist. The adventure begins in no subtle way with the chopping off of your head. Here AM Radio watches as Bjornlyn Loon checks out. 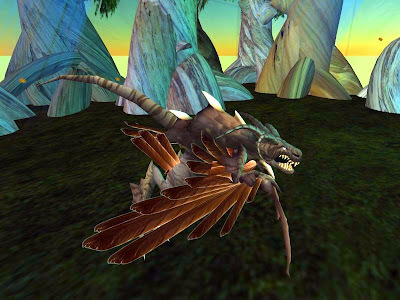 Al Supercharge's soul - now sporting a set of wings - is gently lifted to the great beyond. You arrive at the pearly gates and cross into purgatory. NPIRLers took a moment to meditate on their sins. ...to rather unpleasant, as TeeCee Towradgi would soon discover. Thanks for the field trip, Toran! Kazuhiro Aridian rang me up a couple of days ago to let me know that we'll soon be seeing this creature on the market. Kaz is just preparing the documentation and packaging. I tried it on last night and every detail, from the HUD, animations and particle effects, to the actual av... perfection. Kudos, Kaz! Megaprims breathe life into outreach programs that empower human exploration of space. 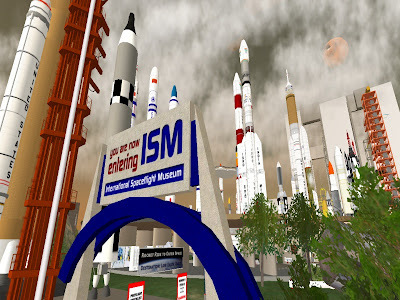 Builder Jimbo Perhaps and his partner, Rocket Sellers, routinely work with megaprims to help real life rocket companies demonstrate their programs in 3D. Jimbo was also responsible for building most of the rockets at the International Spaceflight Museum. 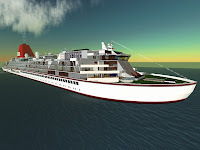 Jimbo explained that he would not have been able to achieve the smooth outer hull with regular prims. This Sun Tower is a recreation of a plan that recommends that the U.S. Government continue studying the feasibility of solar power as an alternative to fossil fuels. Yet another solar power satellite has huge particle beams to show the sunlight being gathered and converted into microwaves. All this would not have been possible without megaprims. 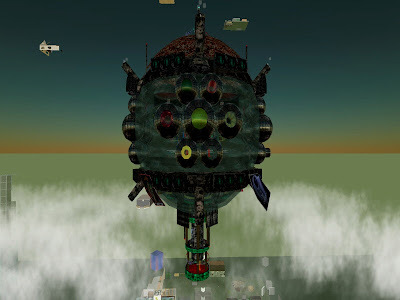 Dear Linden Labs: Give us some editable megaprims, bigger prims, manageable prims... but don't take away our megas... and Michael Linden? It's been two weeks now... Two weeks that builders have been stalled on many projects. Please give the waiting (second) world a favorable answer, and soon! There's Tiffany Blue, Paloma Red and then there's Adam Ramona Blue. It's pure, it's primary, and as far as I'm concerned, it is his signature color. This Aussie artist and musician - Adam Nash in real life - has been working in realtime 3D since 1997. 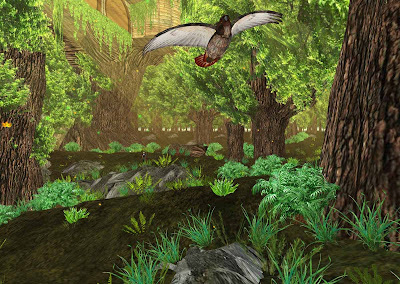 In fact, all of Adam Ramona's first life work is in virtual environments, though not just in Second Life. 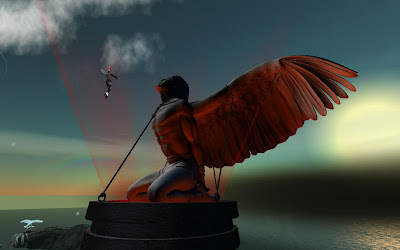 He has several art installations throughout the SL grid, but his largest - and perhaps most celebrated - is sprinkled all over the greater part of the Odyssey sim: Seventeen Unsung Songs. 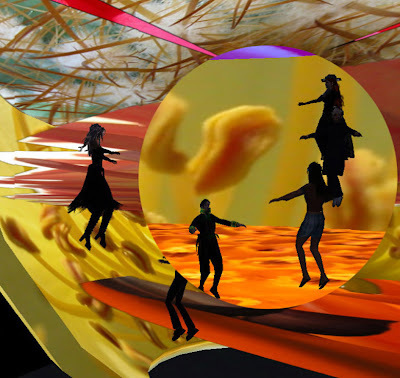 The Odyssey - affectionately referred to as "The Ody" - is the center of the metaverse where experimental art is concerned. The region is a hive of activity, featuring artists that appear to have one mission in common... to rethink everything and push the boundaries, and then push again. We have its benefactor, Pacino Hercules of the Dynamis Corporation, and its curator Sugar Seville, to thank for a number of recent shows that include Gazira Babeli's original "Collateral Damage," as well as performances by the Avatar Orchestra Metaverse and Second Front. Adam's latest show - this gentle, sensorial feast - may well be remembered as the beginning of a new period of interactive and immersive possibilities that involve us even emotionally, but more on that later. "I'm happy when people tell me about their experience (with my work), but it is not a priority of mine because I learned a long time ago that people have the most meaningful experience when they invent the narrative themselves". Now wait just one NY minute!!! This Artist is not going to present me with a structure... with his framework from which I am supposed to see his stuff? ...this lecturer and researcher in Games and Digital Art at RMIT University in Melbourne, Australia... the man whose work is one of the four finalists of the "1st Annual Architecture and Design Competition in Second Life," this very same man whose collaborative team - BabelSwarm - just won the largest grant to be awarded for Second Life work... is not going to tell me what I should be thinking and feeling as I flit about, first here, now there, moving within these living sculptures that move and talk (and sing) back to me? Actually, he did guide me a tad. But first I had to get the skinny on his avatar. "(It) is a tribute to the great Australian identity artist Leigh Bowery, one of the greatest artists in history," said Adam. Oh... my... stars... I started researching Adam's muse, and I just couldn't stop. Apologies for going off on such a tangent, but can you blame me? I will get back to telling you about Adam... but first I have to share that the day before meeting with him, I dropped by Unsung Songs to play a bit, and while checking out the Moaning Columns of Longing piece, generated my very own brilliant white shiny column. It talked to me! [21:04] Bettina Tizzy's Column: Bettina Tizzy loves me! [21:04] Bettina Tizzy's Column: And I love Bettina Tizzy ! [21:04] Bettina Tizzy's Column: My existence has meaning! [21:04] Bettina Tizzy's Column: Because Bettina Tizzy loves me and will visit me again soon! [21:04] Bettina Tizzy's Column: Thank you for loving me, Bettina Tizzy. Without you, I am nothing. Come back and touch me within 24 hours, or I will die. Sure enough, right next to my gorgeous particle-enhanced column of goodness, columns that others had generated stood in varying stages of decline... one little grey one about to call it quits. I resolved not to be like those other people, leaving their creations to die. [21:04] Bettina Tizzy's Column: Bettina Tizzy, I have died of loneliness and a broken heart. 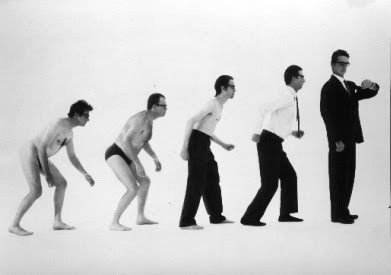 Adam's incursion in 3D/virtual art dates back to 1997, when he was in the (RL) precision absurdist performance group The Men Who Knew Too Much. 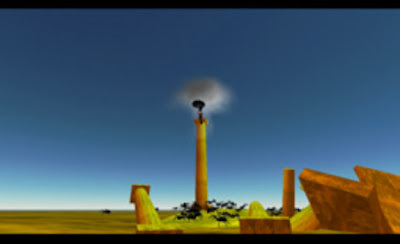 Using VRML with an open source client/server java package called VNet to enable multi-user functionality, The Men began mounting performances in virtual space, as well as real space. 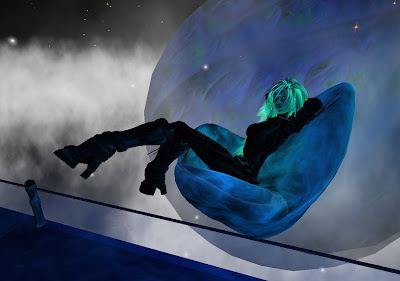 In 2000, for their Virtual Humanoids show, they captured, textured and uploaded audience members in realtime into their virtual world and then made them run around chasing their hero. "It was funny, and very silly. We took a very un-serious approach to technology which was kind of rare at the time," says Adam. 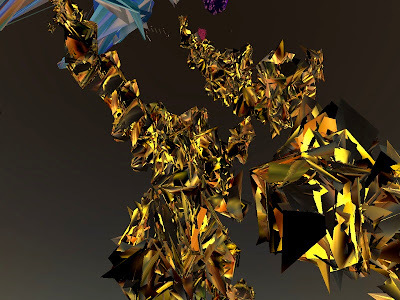 By 2002, Adam had begun to see virtual environments as the performance medium, so he left the group and began to do solo work, while sometimes collaborating with the UK group Igloo and the Australian group Company In Space, though they've dissolved now. He continues to collaborate with one of their founding members, John McCormick - a pioneer in the field of telematic performance and motion capture - and the two are now preparing a work called Ways To Wave, which will premiere in San Jose next June, at 01SJ, the second Biennial of Global Art on the Edge. Regarding collaborators, Adam said, "It's funny, I'm really a very moody, hermit-ish kind of person, but I always end up working with people!" 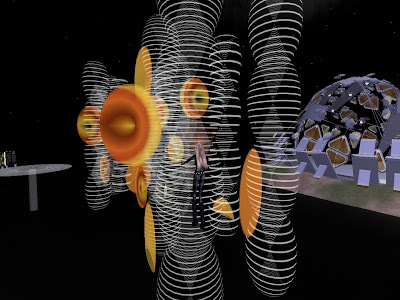 He is also working with fellow Aussies Christopher Dodds (Mashup Islander) and Justin Clemens (S1 Gausman) on BabelSwarm, a simultaneous installation in Second Life and in a real world gallery which explores the possibilities of literary, music/sound art and real-time 3D arts practices. Importantly, Adam doesn't see any meaningful distinction between SL and RL. "It's not possible for SL to be a separate reality any more than music is a separate reality. 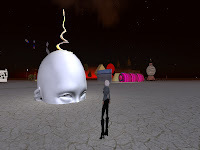 Certainly, it can transport one's consciousness, and many people have transformative or transcendant experiences inworld, but this is also very true of all art and media," he says. Adam uses a range of environments including VRML/X3D, Quest 3D, Multiverse, Torque, Unreal and Pure Data with GEM. He told me, "I do a lot of sound work for other artists, but that is another virtual environment really. In fact, the first thing that attracted me to realtime 3D was that it seemed to similar to the inside of my mind when composing music." "SL is very limited, but technical limitations are exciting for an artist, and they make many formal decisions automatic. There is the huge advantage of virtuality, meaning that there are no physical constraints. An artist can fill a space with lots of invisible sensors, place sounds anywhere in the space, and have limitless triggers for sounds and vision, without having to worry about physical possibilities. Of course, this freedom is countered by the many, many technical limitations in-world. The one I find the most limiting is the inability to play more than 40 sounds simultaneously, and of course the 10-second sound limit, although in many ways I enjoy that particular limitation," he added. ...that when touched, turn into blue blocks, that grow musical branches every 24 hours: blue musical trees. Teleport directly to Unsung Songs from here. For a fantabulous blow-by-blow analysis of several Unsung Songs, you might also want to refer to Dr. Lisa Dethridge's superb piece in the SLART magazine, including a reference to "Yves Klein blue." ;-) That was then... today it is Adam Ramona Blue. January 10, 2008 addendum: A more recent but equally interesting review on Adam by Helen Thorington of Networked Music Review delves into his work with sound. Weddings in Second Life... :o Granted, they are meaningful and important to the people who are tieing the knot, but the *ennui* for those attending! Makes one question the trappings of civilization altogether. Few acts are more deserving of admiration than when a good friend devotes precious hours on a Saturday being subjected to these laggy RL-wanna-be fetes. You: are you gettin gmarried right now? Luna Idler shouts: Meagn, do you take Candy to love and cherish, through scurvy and poverty, til death do you part? 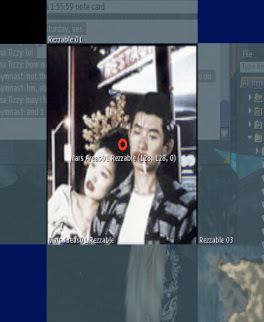 Luna Idler shouts: Candy, do you take Mrgan to love and cherish through scurvy and poverty, til death do you part? Candy gives Megan a big kiss. Nolan Finney gives a happy little howl! Amisja Fillion: whats the point of being married????? Niamh Pfeffer: Congrats Megan and Candy! Hooper gives Frequency a big hug. Luna Idler: we all goin on the honey moon with you two? Megan Choche shouts: go on we all love ya!! RightasRain Rimbaud of Rezzable Productions had been telling me that Miki Gymnast was doing “some interesting things” over at Mars Rezzable, but he would add each time that he wasn’t quite sure what they were. Seems that Miki spent six hours on the Mars simulator last Saturday fiddling with 5,000 prims to create these… well, I don’t know what they are either… but they sure are fun to look at. Oh… and one more hour making the particles. Actually, I’m just joshing you. I do know what they are, ‘cause Miki informed me. These are Borromean rings. According to Wikipedia: In mathematics, the Borromean rings consist of three topological circles which are linked and form a Brunnian link, i.e., removing any ring results in two unlinked rings. She says they are a sign of strength. I'd say they are a sign that Rezzable is adding a shining star to its constellation of great builders. Feedback from the group was unusually positive. All kinds of people - with very different tastes - wrote back to say how much they had liked it. Miki also spent some time with another NPIRLer who apparently helped her work out a simpler process for the sim graphics. “I had used a very very complicated system to bring data in. Lots of coding. He gave me a hint on how to make it much easier. I (had been) going to the bakery via Australia first." Don't care for that color? You have only to wait a minute or less, and every color will have changed. Miki says that she isn’t “really good at building or scripting, but I am able to combine things, and it's fun to explore combinations.” She is German, and explains that “we like programming. (It is) close to our mentality: if yes > do this. If not > do the other thing." She’s a student and has been simultaneously working at an architectural firm for three years, making photorealistic renderings and programming plug ins for cad applications. Miki's first rez day is November 18, and I for one am looking forward to seeing everything this girl is going to do in the months and years to come.